Pitcairn’s intent was to fan the public fires of Autogiro interest, and he set about the task with a creative ingenuity. He arranged for journalists to take rides in the PCA-2, and then used their columns in advertising to tout the revolutionary nature of Autogiro flight. Ernie Pyle had become the aviation editor for the Washington News in march 1928, and won a devoted following with his human interest stories as he became "one of the boys" in befriending the WWI pilots who constantly scrambled to make a living as cargo and mail pilots, and barnstormers who "gypsied from field to field, delighting crowds with wing-walks and offering thrill seekers their first flights for fees of a dollar a minute. "7 Pitcairn arranged for Jim Ray to take Pyle for a ride, and the newsman, in turn, praised Autogiro’s performance in a column dated September 26, 1930. Pyle, who would go on to fame as a combat journalist in WWII before his death on the island of Ie Shima off the coast of Okinawa on April 18, 1945, quoted a flying companion (the front cockpit of the PCA-2 was a two-seater) as exclaiming ""That’s the kind of plane for you and me, Ernie, one that comes straight down and slow." That expresses the whole thing. It’s a great piece of machinery." The Journal has a circulation of three million and goes into three million high class American homes. Each article will be read by seven to ten million people. My three previous books have been in turn read in ten other countries. As they cost $5.00, they are bought by people with money. . . . [the] Autogiro ship would fix the attention on my flight, a cause a sensation wherever I landed. This flight is by no means just an ambition, but already a fact financed equipped, piloted, publicized, waiting only for an extra gas tank to be installed to give me 15 hundred miles radius, but with your new feature, I can pilot my "Flying Carpet" with far greater safety into many more outlandish places, and enjoy the advantage of having the greatest possible public interest behind me. It would promote your new ship, and my new book to the utmost. Pitcairn politely declined the offer, recognizing that the certification process would take considerable time, and, of greater importance, that a support network did not exist for the PCA-2. The Autogiro’s future could only be advanced when aviators could rely on its safety supported by a support system for service maintenance and repairs. But there is little doubt that the possibility of publicity was appealing. make the ten-minute trip in an effective demonstration of the aircraft’s usefulness. Publicity stunts were designed to catch the public’s fancy. 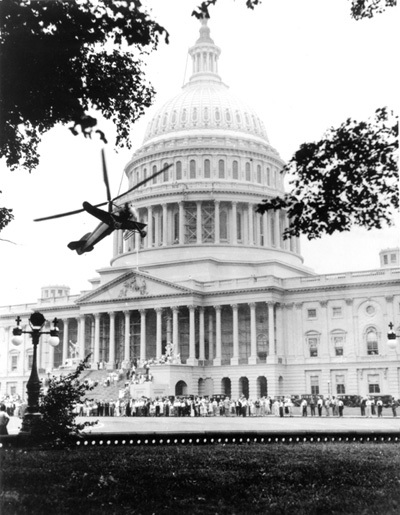 In addition to Ray’s "parking ticket" in Miami, Pitcairn had the pilot land in the parking lot on the east side of the U.S. Capitol Building to pick up Senator Hiram Bingham to fly him to a golf outing at the Burning Tree Country Club10 outside Washing-ton, DC. Pitcairn also had the PCA-2 photographed landing on the lawns of country estates, with many images of the aircraft landing at his own Bryn Athyn home Cairncrest, and flying off to hunting or fishing camps. His advertising agency commissioned paintings, used for magazine and sales brochure illustration, featuring the Autogiro landing at the country estate, at the foxhunt, at the Dude Ranch, and on the country club landing field having just deposited the handsome couple heading for the tennis court.11 But perhaps the most ambitious attempt to garner public attention was the attempt to have Amelia Eahart make the first transcontinental flight in an Autogiro in June, 1931. It did not, however, work out as Pitcairn and his associates hoped. Pitcairn and Earhart’s husband, George Palmer Putnam,12 had seen to it that the world altitude flight in April had been well-covered by the news media, always eager to cover the achievements of the photogenic Amelia – such acclaim met each party’s needs and they sought to capitalize further with the first transcontinental flight. 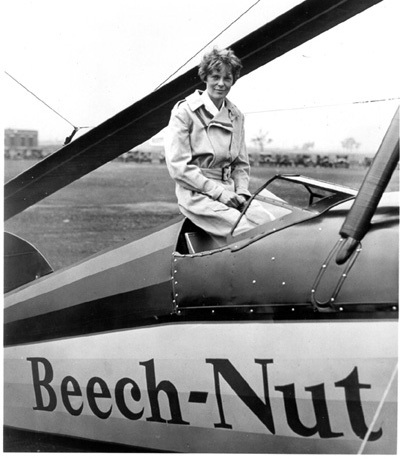 Seeing a publicity bonanza, the Beech-Nut Packing Company, offered Earhart the use of its previously ordered PCA-2 if she would fly it coast-to-coast with the company logo painted on its side and accompanying promotion efforts related to its chewing gum. Brokered by her husband, who was known for his acumen at garnering publicity, she promptly canceled her order in favor of the Beech-Nut Autogiro. However, as Beech-Nut was scheduled to receive the 13th production model, Earhart, superstitious about such things, requested that she receive a lower number and in fact received C/n B-12 (NC10780). She thus displaced United States Marine Corps Reserve Lieutenant John Miller, who had been the first individual to order a PCA-2 and for whom C/n B-12 had been confirmed! Miller, by 1931 with a mechanical engineering education at Pratt Institute of Technology, Class of 1927, and seven years of flying experience, had become the first individual to purchase a PCA-2 for a cash price of the then sizable $15,000 plus "a little extra for an auxiliary fuel tanks and emergency flare racks for night flying. "24 Upon ordering he had been informed that he would receive production model C/n B-12 in April 1931, by which it was anticipated the ATC would be granted (it was on April 2, 1931), a delivery date later postponed to May. At the time of his order, C/n 13 was in the production line, but no order had yet been received.25 Upon receiving confirmation of his PCA-2 order, Miller immediately began planning a transcontinental trip,26 a daring undertaking as no one had previously attempted such a long flight.27 It should be remembered that there were no established radio communication or navigation aides, neither established routes or traffic control and little available weather information other than often inadequate and infrequent advisories for a few frequent areas. That data which pilots now take for granted, weather fronts, air mass, wind conditions, route charts – all were in the future. Miller and other pilots flew with dated Rand McNally state maps and, if lucky, a few "strip" charts printed by the Army Air Service between their fields. And to top it off, Miller had to avoid rain as it would quickly imperil his life in cutting through the rotor blade fabric. This flight was to be in conjunction with a series of exhibition flights – and he kept sales and production officials, including Edwin T. Asplundh, fully informed of the flight plans. Miller was an experienced professional and aerobatic pilot and had gained extensive knowledge of the aerodynamics of the Autogiro from conversations with pilots Jim Ray, Skip Lukens, Jim Faulkner, and Pitcairn chief engineer Agnew Larsen. He would need all of his abilities for the trip west. While the normal cruising speed of the "Missing Link" was 100 mph, Miller flew at 90 mph to conserve fuel and break in the new engine. The Wright R-975-E, 330 hp, air-cooled radial engine consumed 18 gallons/hour, so Miller could only fly for three hours at which point he would only have 15 minutes of flying time on his fuel reserve. Navigation was by magnetic compass, following landmarks such as rivers or roads, and the pilot hoped that when a landing had to be made, there would be an airfield where the Rand McNally road maps showed one – it was not always the case. Miller discovered this at the end of the second day, during which he flew from Harrisburg to Chicago. He had flown seven hops, 11.3 hours over a route he had never flown before, aiming to land at Maywood Air Mail Field – but that airfield had been abandoned, and its replacement, later known as Midway Airport, was not yet finished or marked on the maps. Miller arrived at the site of the older field after dark and, after a perfect landing, located the new field, to which he immediately flew as he would have to refuel before continuing on. He napped on a workbench and, after refueling, left for Omaha at first light. He hadn’t even eaten. He then flew an additional seven hops, 7.2 hours flying and, after arriving at the site of the Omaha Air Races, flew an additional two hours and made 14 demonstration flights after arrival. Miller remained in Omaha from May 16th until the 19th, and then left for San Diego. Headwinds kept him from reaching Clovis, NM on May 26th so he landed en route and installed extra fuel tanks on the front seat during the night. The next day he reached the NM town but encountered strong headwinds on the way to El Paso, which consumed extra fuel forcing him to land 18 miles short of his destination to add fuel. On May 28th he began the last leg of the journey from Lordsburg, NM before first light and, after flying 4 hops for 8.9 hours, landed at North Island Naval Air Station, San Diego, CA. 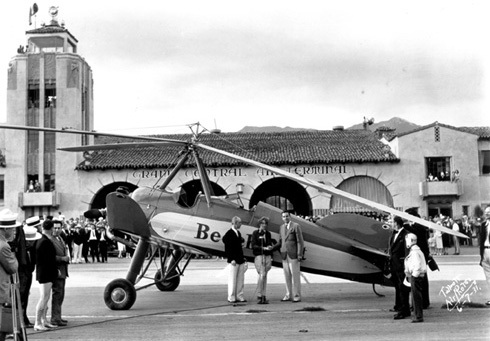 The first Autogiro transcontinental flight had taken a total flying time of 43.8 hours and was without mechanical incident. The aircraft had performed flawlessly with the most difficult task for Miller seemingly to get used to the shadows of the blades passing over his head, and the severe sunburn he incurred.33 He began the return trip on June 21st after demonstrating the Autogiro for Navy officers and other interested parties, and arrived back at the Pitcairn factory at Willow Grove on June 30, 1931. The factory mechanics, interested in evaluating how the PCA-2 had performed, gave it a through inspection – it only needed an oil change! Miller would go on in 1932 to fly hundreds of hours in his PCA-2, thrilling crowds with his performance of the loop and other aerobatic maneuvers.34 Of the PCA-2, Miller would state 70 years later: "[T]he PCA-2 still had the original air in one of its tires when sold with 2000+ hrs flying time. It was a first class aircraft and the safest in history, in my considered judgment the only INHERENTLY safe aircraft. "35 He received the Sikorsky Award for his part in the evolution of the helicopter, a Certificate of Honor from the National Aeronautic association for his contributions to aviation, and had been mde an honorary fellow in the Society of Test Experimental Pilots for having "promoted the moral obligation of the test pilot to the safety of the aerospace world." His fellow Society members include General Jimmy Doolittle, Howard Hughes, Charles Lindbergh and Igor Sikorsky. A modest man, Miller replied when questioned in 1996 as to how he felt he would be remembered: "I didn’t go after records or the publicity. I just went out and did the work." But Amelia Earhart and her husband George Palmer Putnam were very interested in the publicity, and they and the Pitcairn executives that had tried to arrange for her cross-country flight to be the first, were in for a surprise! John M. "Johnny" Miller had beaten her by 9 days. The Aeronautic Branch of the Department of Commerce, renamed in 1934, the Bureau of Air Commerce, did not accept her version of the incident and issued her a formal reprimand for "carelessness and poor judgment" based on report made by the local inspector R. W. Delaney. Actually, the govrnment had intended to ground Earhart for 90 days had her friend and NAA president Senator Hiram Bingham not pleaded her cause to the Aeronautic Branch of the Department of Commerce. He secured a lesser penalty, a formal reprimand from Clarence Young, then Assistant Secretary of Commerce for Aviation. Amelia Earhart’s second Autogiro crash is known from a single source, a letter39 to author Susan Butler from Helen Collins MacElwee, sister of Amelia’s New York, Philadelphia and Washington Airway Corporation (NYPWA) colleague Paul Collins. Paul Collins and his sister Helen witnessed the second accident. After a "rather erratic" Autogiro flight she made after taking off from the airfield in Camden, New Jersey, she "finally landed on a fence. Amelia stepped out frustrated and furious, and announced, "I’ll never get in one of those machines again. I couldn’t handle it at all." Earhart’s third accident in an Autogiro occurred during her subsequent Beech-Nut tour while at the Michigan State Fair in Detroit, Michigan on September 12, 1931. Attempting a slow landing in front of the grandstand, she failed to level off in time and dropped twenty feet to the ground. She wrote her mother: "My giro spill was a freak accident. The landing gear gave way from a defect and I ground-looped only. The rotors were smashed as usual with giros, but there wasn’t even a jar. "40 Although she did additional flying for Beech-Nut in a mutually profitable arrangement, her significant contact with the Autogiro finished with the end of 1931. She was already planning the solo trans-Atlantic flight of May 20-21, 1932, which would win her the National Geographic Society Special Medal, the first awarded to a woman pilot. With the perspective of over 70 years, it is readily apparent that Earhart’s involvement with the Autogiro was relatively insignificant. The general consensus was that she was an "impatient" pilot, and that her accidents were the product of lack of training and lack of attention to detail. The crash in Kansas appears to have resulted from forcing takeoff without the rotors having achieved high enough rotation, while Detroit was the result of not having spent enough time practicing landings. To be sure, the Autogiro, despite Pitcairn’s public claims of ease of operation touted in virtually every advertisement and public pronouncement, was a difficult aircraft. Amelia’s friend, pilot Blanche Noyes,41 who was hired to fly a PCA-2 for an oil company, ridiculed Pitcairn’s claim that "a ten-year-old boy" could fly an Autogiro. She related, in her Oral History (which is part of a collection at Columbia University)42 that the factory training aircraft was called the Black Maria43 because so many pilots had accidents.44 So the report of Earhart’s declaration after her second accident rings true, perhaps sported by an observation made in an article in Fortune in 1932 assessing a year’s Autogiro progress: "It is reported that Amelia Earhart, since her two crashes, opines that it is as hard to make a perfect landing with an autogiro as it is to make a perfect drive on the golf course. "45 And it is known that she accepted the Beech-Nut tour which took her to Detroit and her third accident because she needed the money. In many ways her lasting and most serious contribution to the Autogiro may have been the article she published in Cosmopolitan Magazine in August 1931.46 The article predicted that the day was fast approaching when "country houses would have wind cones flying from their roofs to guide guests to the front lawn landing area" (Harold Pitcairn’s home, Cairncrest, already did! ), and Autogiro hunting and fishing trips for the weekend would be common, as well as quick sorties to golf and aviation country clubs and a new convenient way to commute to work. This article almost exactly mirrored the images conveyed in Pitcairn advertising,47 and Carl R. Gunther, Pitcairn Aircraft Association Archivist and historian, has suggested that the Fortune article was probably written, not by Earhart, but by either Pitcairn Aircraft or its advertising agency. That agency also authored many dramatic advertisements for American magazines, such as Town and Country, with spectacular Autogiro photographs and copy, and promotional brochures designed to inform and intrigue the affluent.48 The result was a public relations bonanza! 1. It is interesting to note that Cierva’s article on page 35 was immediately followed on the next page by an article by Don Rose, as Cierva and Don Rose would collaborate on the 1931 book. Wings of Tomorrow: The Story of the Autogiro published in New York by Brewer, Warren & Putnam. 2. Alternatively attributed as Pitcairn chief pilot Jim Ray. 4. Ingalls, David S. "Autogiros – Missing Link" Fortune. March 1931 pp. 77 – 83, 103 – 104, 106, 108, 110. Ingalls referred to "Inventor Cierva and Impresario Pitcairn" in his introduction describing "the most promising new flying machine in the thirty-year history of aviation." 8. Many years after his death, however, it would be asserted by literary researchers that Halliburton had not, in fact, done the daring feats described in his many books. For example, he describes a clandestine midnight swim in the pools at the Taj Mahal – which is now acknowledged as more a flight of fancy than an actual achievement. Such posthumous assertions aside, however, it cannot be denied that Halliburon was a credible and recognized adventurer of the time – with a very real publishing contract with, in 1930, the Ladies Home Journal and Bobbs-Merrill Company. 9. That telegraph is currently in the possession of Michael Manning. Thanks are due to Deane B. McKercher for making a copy available to the author. 13. For background information on Glenn Curtiss, see Jablonski, Edward Man With Wings pp. 79 – 92; see also Yenne, Bill Legends of Flight. (forward by Frank Borman). Lincolnwood, Illinois: Publications International, 1999 p. 27. Curtiss was no stranger to speed – in 1907 he had established the world speed record in a motorcycle when he was officially clocked at 78.26 mph. 14. Letter from John M. Miller to the author dated February 28, 2001. This letter gives many details of Miller’s early life and inspiration, and is hereafter referred to as the "February 28, 2001 Miller letter). 15. Shamburger, Page and Joe Christy Command the Horizon: A Pictorial History of Aviation. New York: ,A. S. Barnes and Co., Inc., 1968 p. 36; For a description of Curtiss’ flight and a photograph of the Golden Flyer circling the Mineola Fairgrounds, see TAKEOFF! How Long Island Inspired America to Fly. (Forward by Nelson DeMille) Melville, NY: Newsday, Inc. 2000 p. 3. This book also maintains that Curtiss won $10,000 for the Mineola flight, but that is not documented elsewhere. In 1911 Earle Ovington had flown a sack of cards and letters from Garden City to nearby Mineola – it was the first transport of the U. S. mail and preceded the first established regularly scheduled airmail service in 1918 from Long Island’s Belmont Park and Washington, DC. 16. Long-time Hofstra University President ( 1976 – 2001) James M. Shuart often remarked that his school wasn’t so bad for "some old landing strips." 21. In 1915 Law would set a new altitude record of 11,500 feet and the next year she would attempt a flight from Chicago to New York. 23. "February 28, 2001 Miller letter"
25. "February 28, 2001 Miller letter". 26. Thus the suggestion by Pitcairn’s biographer and admirer Frank Kingston Smith that "[w]hen he [Johnny Miller] learned that Earhart had been advanced ahead of him on the production and delivery line, he took off for the West Coast without fanfare and beat her by two weeks" is, in its implication, incorrect. Miller had long planned his trip, and had, in fact, contracted for air show performances at the Omaha Air Races on May 17, 1931. His sudden departure for the west wasn’t occasioned by the announcement of Earhart’s flight but the need to fulfill a previous commitment. He then, of course, continued on to the West Coast. 27. See also Miller, John M. "The First Transcontinental Rotary-Wing Flight – Part 3 Vertika: The Newsletter of the American Helicopter Museum and Education Center Vol. 7 Issue 2 October 2000. Vol. 8 No. 1 February 2001; "The First Transcontinental Rotary-Wing Flight." Vertika: The Newsletter of the American Helicopter Museum and Education Center Vol. 7 Issue 2 October 2000.Vol. 7 No. 2 October 2000. 28. Miller, John "The First Transcontinental Flights with a Rotary-Wing Aircraft 1931" Popular Rotorcraft Flying August 1992 p. 12; "February 28, 2001 Miller letter"
32. Frank Kingston Smith incorrectly asserts that Miller flew the "Silverbrook Coal PCA-2 a week before [Earhart]." Smith, Frank Kingston. Legacy of Wings: The Story of Harold F. Pitcairn p. 188. It is difficult to know how this attribution could be made as the pictures of Fred W. "Slim" Soule flying the Silverbrook Coal Company PCA-2 (NC10786) and Johnny Miller flying the "Missing Link" (NC 10781) are on facing pages. (182 – 183). 34. Miller was not the first to do a loop in an Autogiro, but was the most widely-known pilot to perform this maneuver. He first proposed a loop in public at the 1931 National Air Races, but was prevented by the Pitcairn company that assured the Air Races organizer Cliff Henderson, that it would prove fatal. Miller learned from Pitcairn pilots that they had been forbidden from looping, but the 1932 National Air Races at Cleveland were a different story. Miller, a highly skilled aerobatic pilot, knew he could do the loop – and he did! He looped for the first time before an enthusiastic crowd on August 27th and continued in his daily performances for the next seven days, but on September 3rd after his flight, he landed but as he reached for the rotor brake, his aircraft was struck by a pre-WWI Curtiss pusher flown by Al Wilson. Wilson had elected to end his performance by ‘buzzing’ the PCA-2, unaware that since the Autogiro had made a steep descent, there was a residue column of air from its rotor. Wilson’s plane hit the downdraft of air, dived into the ground, resulting in his death and doing much damage to the "Missing Link". It took 27 days before it could fly again, costing Miller appearance fees, but he knew he had gotten off lucky – his friend was dead. 38. Lovell is incorrect in stating that "A replacement autogiro was hurriedly shipped to her [after the Abilene, TX crash] and Amelia continued her trip to Newark without further incident." Lovell, Mary S. The Sound of Wings: The Life of Amelia Earhart p. 171. See Smith, Frank Kingston. Legacy of Wings: The Story of Harold F. Pitcairn p. 189 "Unfortunately, she [Amelia Earhart] had to complete her transcontinental trip by rail . . . "
42. Oral History Collection, Columbia University, Vol 1, pt. 3, p. 17. 44. Johnny Millers maintained, in corrections to the manuscript, that this was "not so" and that "while in experimental development it had accidents, but then was an excellent Autogiro. I liked it very much." 48. For examples of the ACA advertisements, see Townson, George. Autogiro: The Story of ‘the Windmill Plane’. Fallbrook, California: Aero Publishers (1st ed. ); Trenton, New Jersey: Townson, 1985 (2nd printing) p. 1551, 154 – 155. © The Aviation History On-Line Museum. 2003 All rights reserved. Revised: February 01, 2003 .